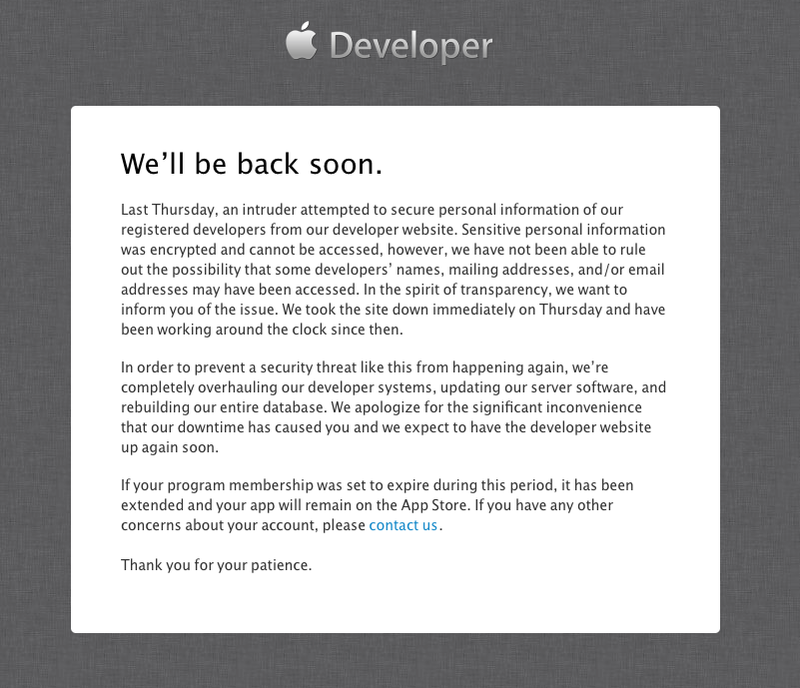 If you follow me on twitter you would have noticed me going completely insane because the Apple Developer portal for both OS X and iOS has been down for about 4 days now. Apparently on Thursday when the site was first taken down someone hacked into the portal trying to get some information which is encrypted, however if the hacker(s) took names, emails, and addresses is still unknown. Apple is now rebuilding the entire developer database with all users information and updating their servers to make sure they are more secure. All developers who would need to have their accounts renewed have been given an extension and their app will remain on the app store. For beta testers such as myself this could mean that tomorrow we will not see our 2 week beta seed giving us the seed for beta 4. They may be able to push it over the air but not have a download link or they will most likely do it the Monday after.